Twelve months of jaw-dropping photography, love-of-nature-inspiring stories, and can’t-miss events, camps, and classes. 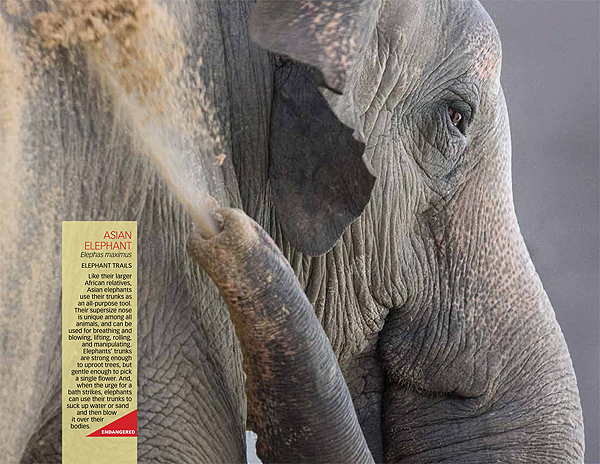 The Friends of the National Zoo wall calendar is packed with benefits for members of the Smithsonian’s National Zoo, and is produced to such a standard that it is one of the reasons many members list for renewing their memberships each year. 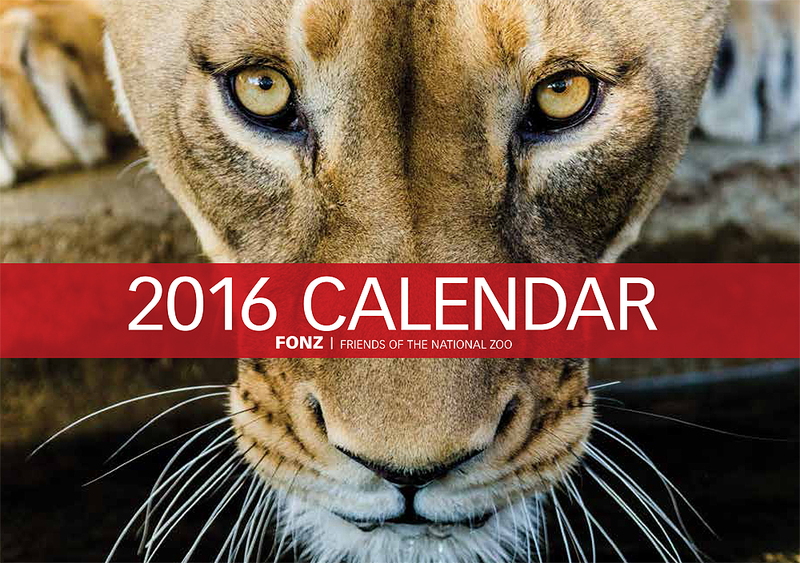 The 2016 Friends of the National Zoo wall calendar features twelve incredible large-scale photographs of animals at the Smithsonian’s National Zoo, as well as numerous smaller images. 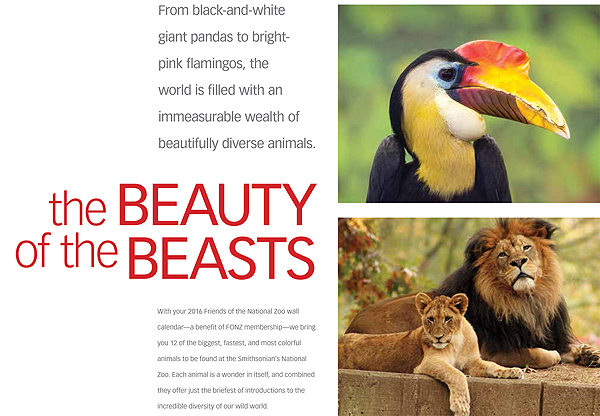 All images were donated by the Friends of the National Zoo Photo Club, the process of which was managed and coordinated by me. 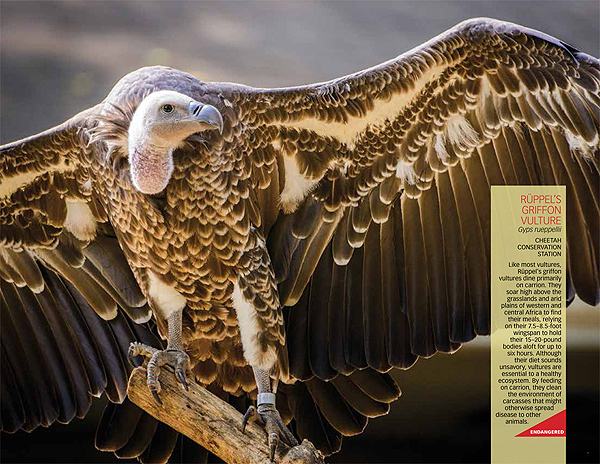 Accompanying each month’s animal photograph is a compelling fact about that animal. 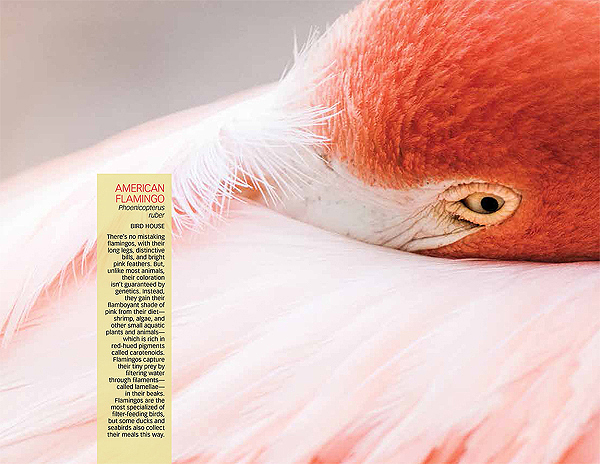 Each fact highlights something exceptional about the featured animal, such as the strength and flexibility of an elephant’s trunk or the filter-feeding prowess of flamingos strangely curved bills. The FONZ wall calendar is distributed as a free member benefit to the ~35,000 FONZ member households every year. In a perfect win-win scenario, the calendar provides members with an attractive way to track dates and appointments. But, the benefits do not end there. By including information and calls-to-action throughout the calendar—and by highlighting big events and ticket-buying deadlines—the calendar helps drive up membership participation in FONZ events, classes, and camps throughout the year.